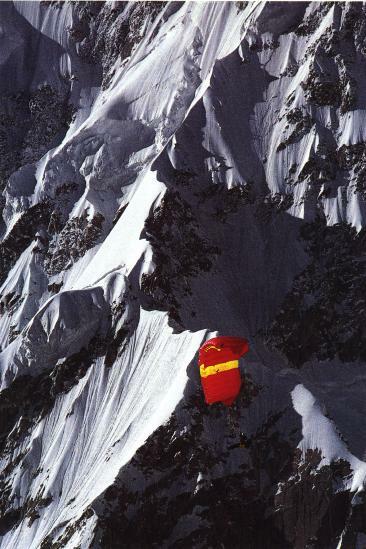 This page describe the first ascent of the Bularung Sar, 7200 meters by a Swiss expedition in the Karakoram in July 1990. 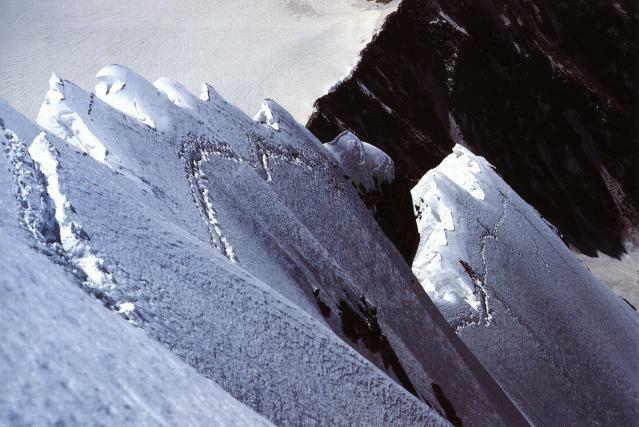 This expedition has been organized by the Swiss Alpine Club Neuchâtel Section, with the sponsoring of "Fondation Louis and Marcel Kurz"
Alain Vaucher, Heinz Hügli, Lothar Matter, Carole Milz, Thierry Bionda, Christian Meillard, Gerard Vouga, Vincent von Kaenel, Jean-Jacques Sauvain and Jacques Aymon. The original text has been written in french by: Carole Milz, Thierry Bionda, Heinz Hügli, Jean-Jacques Sauvain and Alain Vaucher. This approximate translation is due to Vincent. Click on images to get a larger version. Some more pictures here. Interactive route pictures page can be seen here. 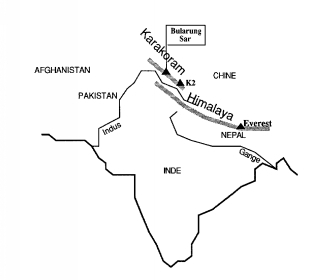 Karakoram Highway. After 5 days in Rawalpindi, we are on our way to the Northern part of Pakistan, to adventure. 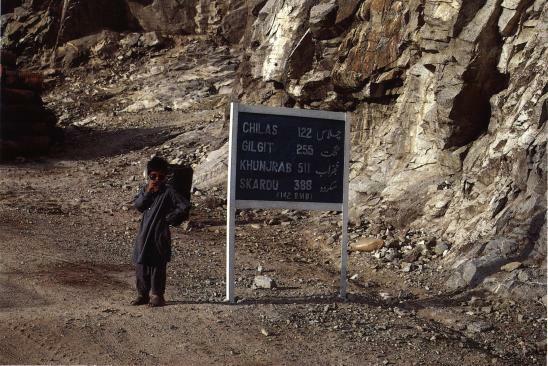 This road links Pakistan to China, it follows the Indus River at the bottom of impressive mountains. Landslides and fallen rocks are frequent. 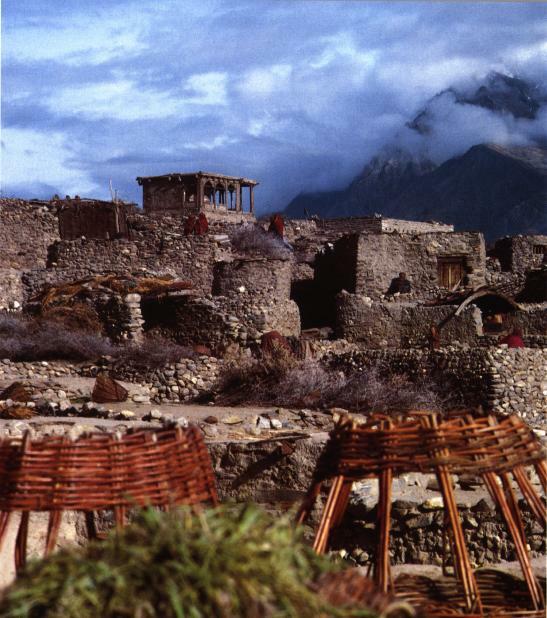 Before leaving the Karakoram Highway, we crossed the Hunza area, a very fertile valley, land of centenarian. 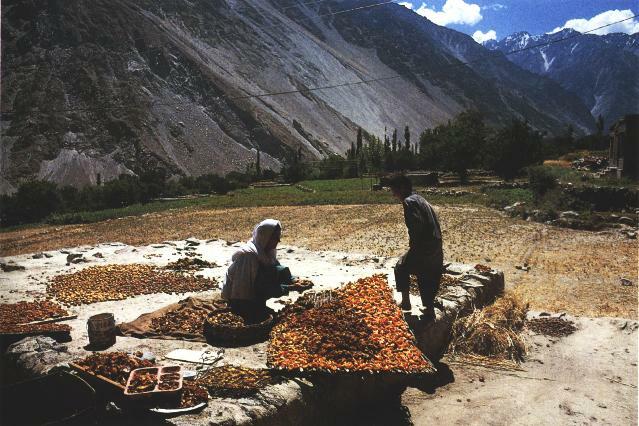 Even if these fruits (apricots) do not give you immortality, they are the base food for Hunzakuts. Everything is used, the pit is used as combustible, the almond is grind, eaten or pressed for the oil, the flesh is eaten also. Hispar. The village of our carriers, last village on our way to Base Camp. During our two days of rest we spend in Hispar, we are the center of interest of Hispar's kids and adults. They observed our camp, close to the village. Their houses are all close to each other, separated by small paddocks where the livestock is. 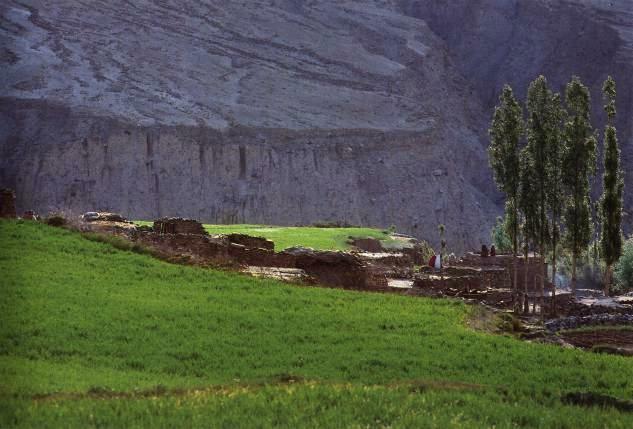 Hispar village is situated on an irrigated plateau. This is the last island of greenness before the stretch of ice and rocks that waits for us. When we will be back, two month later, the wheat will be ripe. 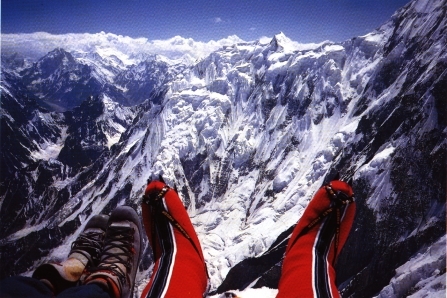 We would have lived an unforgettable experience on the mountain. During the same time at Hispar, life goes on simple and quiet. The inhabitant do not care about mountains, just about the harvest. Will they have enough food for the winter? During the flight of our three paragliders, everyone is outside to watch the flying men. After Thierry's landing in his wheat field, the landowner, not really happy said: "Good flight, bad chapatis!" and asked for a few cookies as compensation. Once hired, after endless discussions, the carriers load up our material. 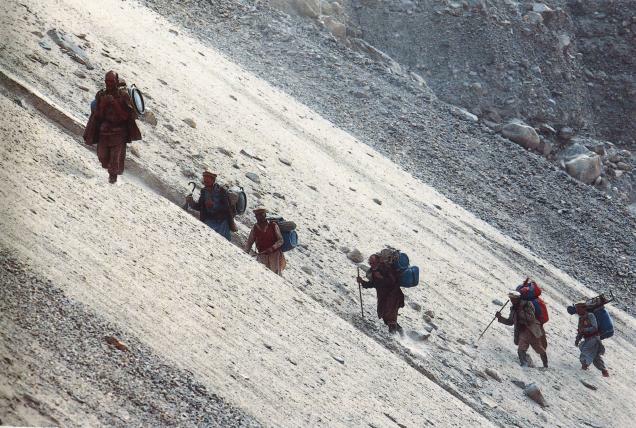 They carry 25 kg each, and walk with no complains on steep slopes and on glacier. Their equipment is very simple and ill assorted. Their shoes? Plastic boots, sandals or old mountain shoes, gifts from past expeditions. Most of them wear the traditional shalwar kameez, the Pakistani national costume. Over that, they wear waistcoat and cover of all kind. 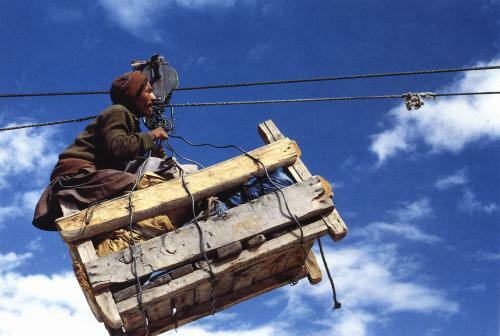 When there is no bridge, the river crossing is done with a fragile wooden basket hooked to a cable, and ... Inch Allah! Sometimes the traction rope break and people in the basket must pull out the cable to cross the river. On our way back we gave them a new rope to replace the old one. After a few days of walk, here it is... the majestic Bularung Sar, goal of our trip. It is our dream, our hope and show us its south face. Everyone trace his own road to the top and place a few altitude camps on the way. It is beautiful and impressive! This is not any more a mere dot on a map, a name or a picture. It is here, real. It is waiting for us. 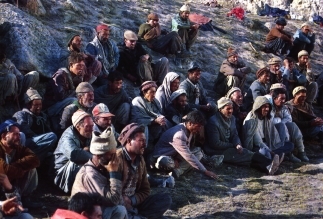 After unloading our material at the base camp, carriers are waiting for the most important time for them, pay distribution. They deserve their pay, and stand up one after the other to get the money from our cashier hands. Safar Beg, our cook, has built his own house in his village of Gulmit. 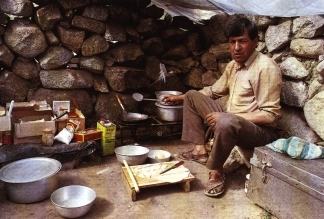 He did not have any problems to build his kitchen with rocks in the base camp. His aide, Shadjii help him prepare meals. Each time we come back from a high altitude camp, tea is ready and we are welcomed with his smile. In the morning, Safar Beg make oatmeal and fresh chapatis, even when we wake up early to avoid midday heat. 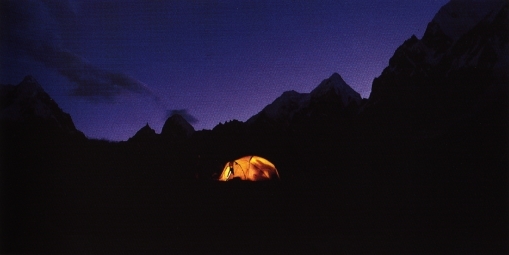 In the evening, everyone goes in the intimacy of his tent. With the light of a candle, we make the most of those rare moments to read or write a letter or a journal, to meditate, think, listen music or sleep. During three months, our tent has been our house, our little comfortable nest, where it was fun to think about those who stayed in Switzerland. 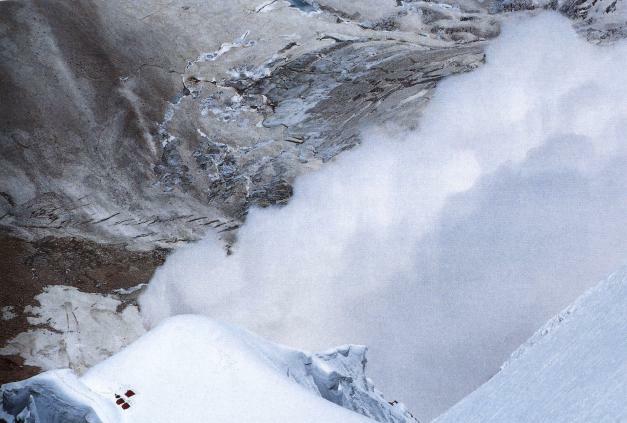 Everyday avalanches raged down the slopes of the surrounding summits. It is impressive to see this mass of snow which moves at more than 200 km/h (125 miles/h) and fills the whole area with a cloud of snow in a thunder noise. 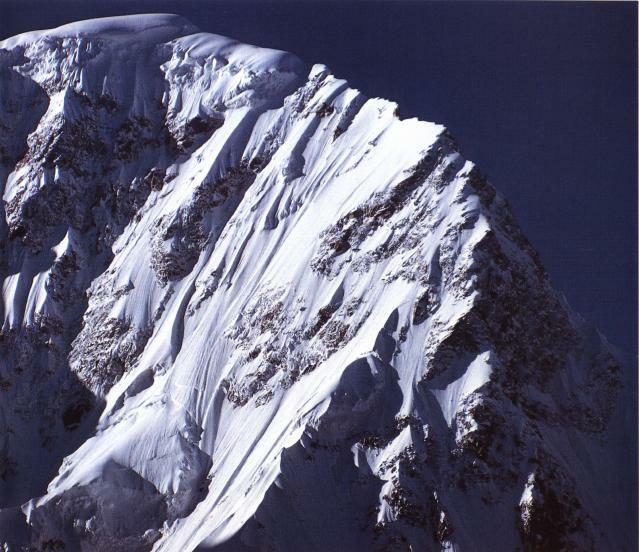 The Trivor, summit of 7650 meters is part of the chain of the Bularung Sar, has been climbed in 1960 already by a west road. 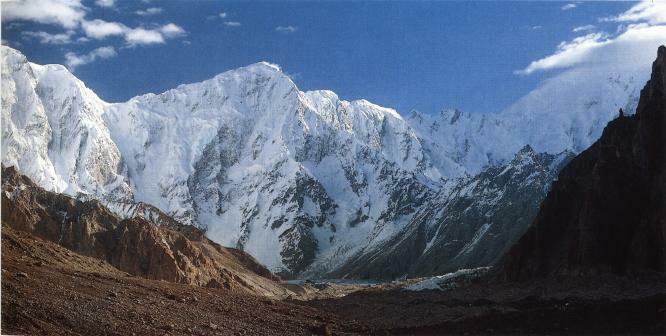 Its south face is constantly cleaned by avalanches. The road we choose is a well protected ridge. 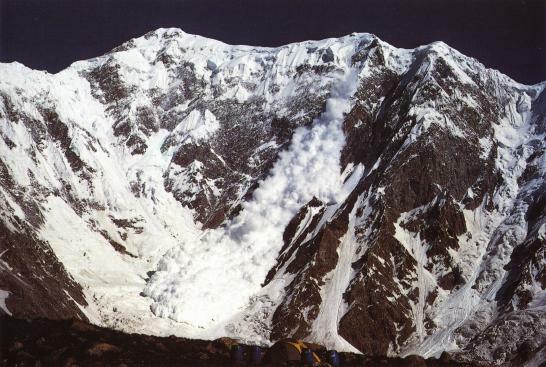 On each side avalanches are frequent. From camp 2 we can admire them. This high altitude camp has been put on the only flat area of the whole road. We installed three tents and a reserve of food. The rocky part of the road is made of granite dieters. In spite of the technical difficulty, the high quality of the rocks allow secure relays and a wonderful climb. 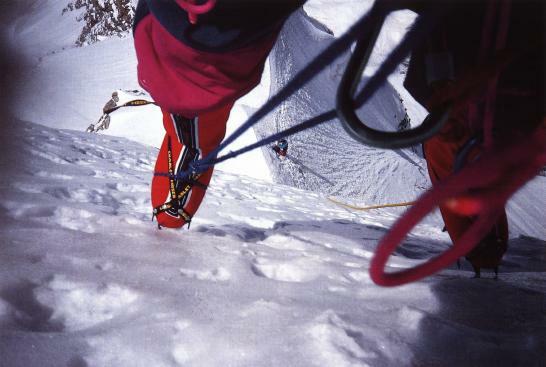 Overall, 2400 meters of fixed ropes have been installed between camp 1 and 4, a huge work for the leaders. 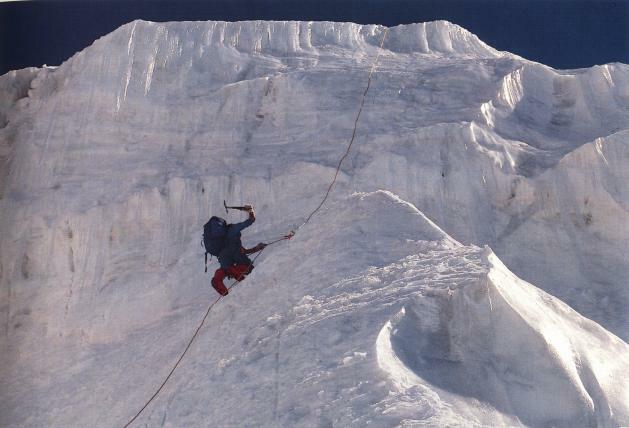 For the others, climbing along these ropes is an ungrateful task, but necessary. One of the key difficulties of the road is an vertical ice wall. 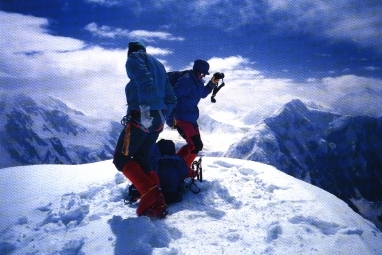 Once climbed, it opens the way to the summit. This was the section that make us hesitating about this road at the beginning. From the base camp it is not easy to estimate the technical difficulty of a section. Climbing vertical ice with a heavy load is hard. Everyone has his own technique. Some are only using the rope, most use the rope and an ax. Hopefully, camp 3 is not far. We will be gratified for our effort by a tea or a soup. The breath will regularize and the hear beat rate will slow down to a normal rate. A close view of the summit shows the road difficulty and steepness. 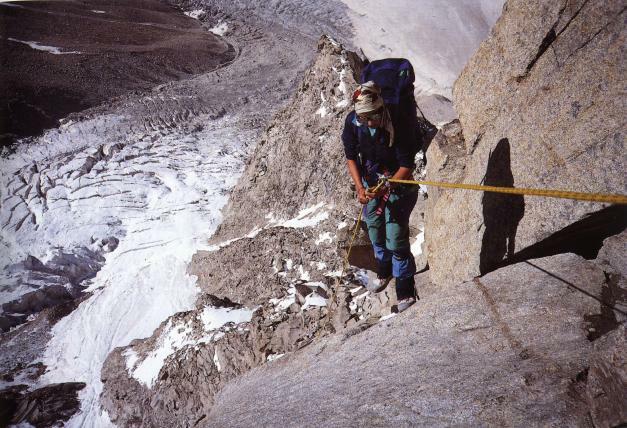 From base camp, with our telescope, we study each step , each rock each meter of the ridge... Climbers are like ants we follow, slowly making their way to the top of this huge mountain. 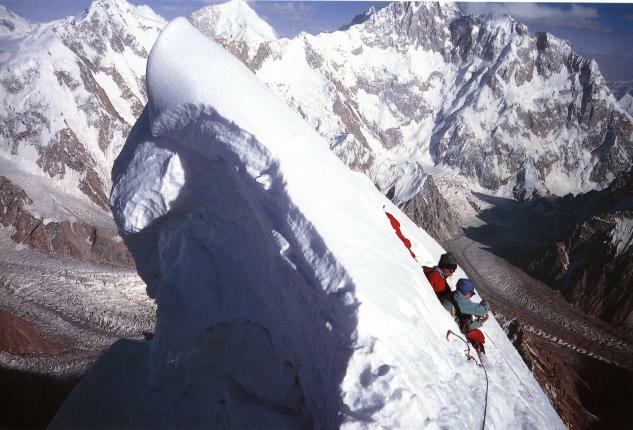 The very steep section below the top ridge has been climbed quickly by the guides team. 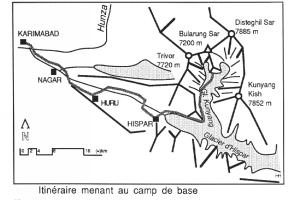 From there we have a bird's-eye view on camp 3, 2 and 1, and also on the base camp. In the royal lodge of camp 4, at 6600 meters, our feet are hanging over the slope, we are looking south to a lot of know or virgin summits. To protect our feet from humidity and cold, we wear neoprene gaiters on the top of our regular shoes. 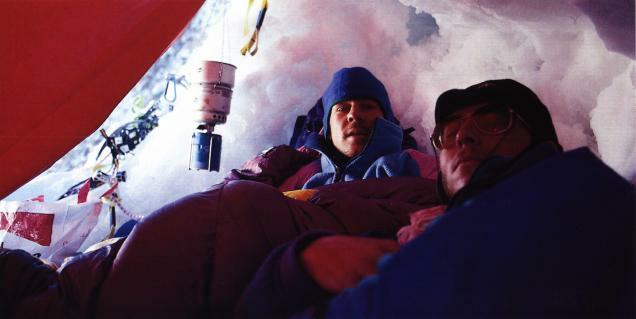 We spend the night in camp 4, roped in our sleeping bags, isolated from cold by a thick layer of down and empty backpack. Our stoves operate with gas (butane propane mix) and never failed. To heat a liter of warm water, an hour is necessary. We spend a lot of time in the high altitude camps to melt snow and heat water. It is vital to drink a lot at high altitude. The road to the summit avoid cornices. Sometimes we have snow up to the chest. Bularung Sar summit, 7200 meters. Joy is immense, everybody reached the top. This trigged a little "dance of the summit" before watching all the surrounding summits. Emotional moment, joy, intense communion. Radio calls, photos. Even the strong wind and the cold cannot damp our enthusiasm. Our hearts have no problems, we do not feel even a small headache, this proves that we are well acclimated to high altitude. Almost complete team delighted by success. 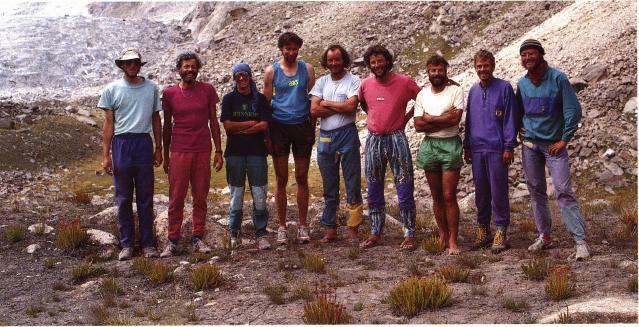 From left to right: Jacques Aymon, Heinz Hügli, Carole Milz, Jean-Jacques Sauvain, Christian Meillard, Gerard Vouga, Thierry Bionda, Vincent von Kaenel, Lothar Matter. 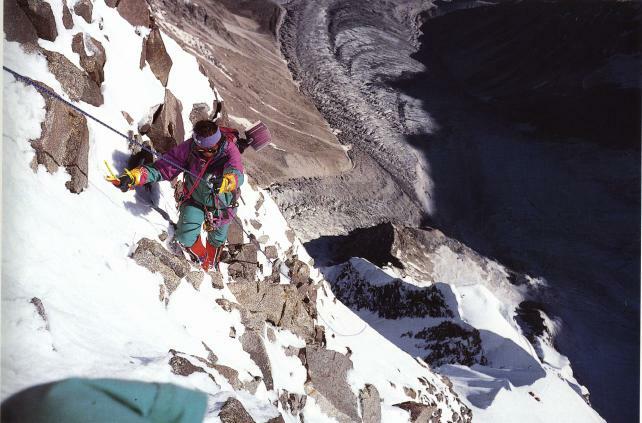 The expedition leader, Alain Vaucher, is missing on the picture. No accident, a nice friendship, an extraordinary adventure... what else can we ask for? 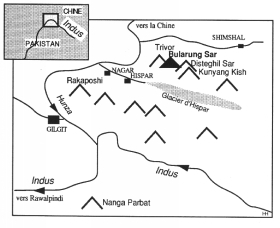 The route we used to climb the summit. Click on the map to get some more details.